Japan/Ricoh Creative Service Co., Ltd.
Ricoh Creative Service (RCS) provides offices and factories with operational support services to help increase their productivity and reduce costs while at the same time cutting CO2 emissions. The company thus fosters energy conservation at business facilities. The number of facilities that have already introduced high-efficiency equipment is growing as a result of on-site continuous improvement activities. In recent years, the importance of energy conservation through improving the operational efficiency of existing equipment has been increasing as a means to reduce further investment. The optimal operational conditions for equipment depend on the specific use conditions as well as how long the equipment has been used and how it has deteriorated. In order to avoid energy loss and minimize CO2 emissions, it is not enough to “set and forget” the optimal operational conditions for the equipment. Rather, after setting the conditions, the equipment must be regularly inspected and the settings changed as appropriate. To this end, it is necessary to visualize energy use and continuously fine-tune the equipment. This is where RCS comes in. RCS monitors energy use at the Ricoh Group’s facilities across Japan. Based on the data gained through this activity, RCS has built up a database of energy use at the sites by area and usage and discloses the data back to the sites via the intranet. The visualization of energy use helps each site understand its present situation and make comparisons with other sites to examine improvement measures. In addition, the database includes information about on-site energy conservation activities, which fosters the adoption of good practices across all sites. To ensure the optimal tuning of equipment, RCS makes use of the 450-item energy conservation checklist, which it has independently developed, then evaluates and verifies the equipment and identifies points to be improved. For example, to optimize the use of indoor air conditioners, the company investigates the time required for air conditioners to reach the preset temperatures and reviews the setting by season. Moreover, in order to foster energy conservation in an ongoing manner, it is essential to clarify the operational rules. Accordingly, RCS has formulated detailed equipment management standards to help the sites achieve energy conservation while avoiding any disruption due to personnel changes. In recognition of these improvement activities and know-how as well as the energy conservation activity results, RCS was granted the 2014 Environment Minister’s Award for Global Warming Prevention Activity (in the category of “Countermeasure Technology Introduction and Dissemination”). Specifically, the activities that RCS conducted in collaboration with the Ricoh Technology Center (Ebina City, Kanagawa Prefecture) and the Yashiro Plant of Ricoh Electronic Devices (Kato City, Hyogo Prefecture) received commendations from the Minister. The Ricoh Technology Center reduced its power consumption by 8% in fiscal 2013 relative to 2010, when the new building was completed. The Yashiro Plant of Ricoh Electronic Devices further improved the clean room used for semiconductor production in terms of energy efficiency, which led to a year-on-year decrease in CO2 emissions (by 1,300 tons) in 2012. The ESCO business contributes to the profitability of customers and the conservation of the global environment by offering a comprehensive energy conservation service. The providers of the ESCO service ensure customers experience energy conservation effects and instead of payment receive part of the benefits flowing to the customers as compensation (as defined on the website of the Japan Association of Energy Services Companies). The Ricoh Ikeda Office made use of RCS’s ESCO service to update the air-conditioning system used for its clean room and office building to increase energy efficiency while minimizing the cost. The air-conditioning equipment servicing the clean room of the Ikeda Office was quite old, having been used since 1981. 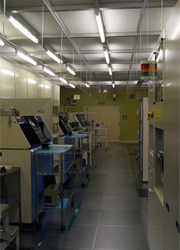 When the site discontinued production of semiconductors in 2004 and shifted to R&D into new technologies, the clean level required for the clean room was changed. Against this background, it was critical to update the air-conditioning equipment for higher energy efficiency, but the investment required was large and it would have taken a long time to recover the cost. To solve this problem, RCS provided the Ikeda Office with a new air conditioner installation service as part of the ESCO service and covered one-third of the cost by making use of the government subsidy and the related financing system. As a result, the Ikeda Office was able to increase energy efficiency earlier than initially expected. The revised Energy Saving Act that went into effect in April 2014 places emphasis on leveling power demand load (reducing peak power), and the Ricoh Technology Center located in Ebina, Kanagawa Prefecture has long been working to reduce peak power. The Ricoh Technology Center is a core Ricoh Group manufacturing site that employs about 5,000 people. When the Center erected a new R&D building in 2010, it installed a Building Energy Management System (BEMS)*1 in all structures on the premises to monitor and analyze the power consumption of each building in view of expected increases in power consumption. The 2011 Great East Japan Earthquake also highlighted the importance of “peak power reduction,” and the Center has undertaken comprehensive energy conservation activities aimed at cutting peak power and overall power consumption. To boost employee interest and awareness concerning these activities, the Center also used digital signage, the intranet and other means to disseminate information. As a consequence, the Center was able to reduce power consumption by 8% (1,983Mwh/year) in fiscal 2013 from the level in fiscal 2010, when the R&D building was completed, and achieve a 19% reduction (1,416kw) in peak-time power. These energy-saving activities have garnered numerous awards for the Ricoh Technology Center, including the Ministry of Economy, Trade and Industry’s FY2013 Kanto Regional Bureau of Economy, Trade and Industry Director’s Award. The power-saving activities have primarily been carried out by Ricoh Creative Service (RCS), which is responsible for running energy facilities at Group companies. 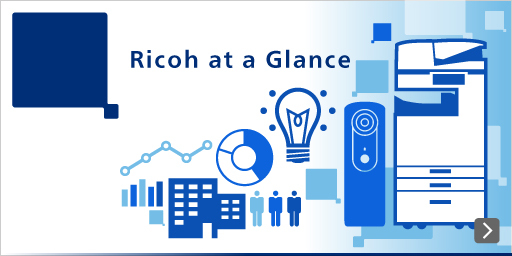 Ricoh intends to make further power savings by extending RCS’ energy management know-how and experience in energy-saving activities to other Ricoh Group offices. *1Building Energy Management System (BEMS): a system that manages facilities, equipment and fixtures in buildings to ensure that energy is used efficiently and to optimize energy use.